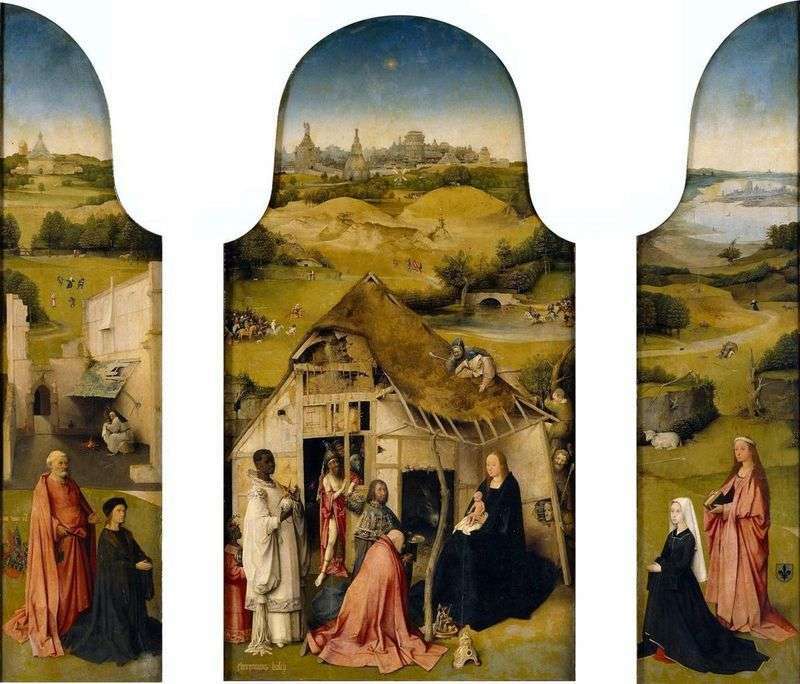 I. Bosch created several triptychs on biblical themes, one of the last is “Adoration of the Magi”. The main part of the work shows the main plot. The Mother of God is in front of the house and shows the baby. The Magi lay the gifts to the feet of a woman. The painting depicts the moment of the sacrifice, Abraham is going to sacrifice his son. Such an event symbolizes the sacrifice of Christ, it is his crucifixion on the cross. On the chest of one sorcerer is depicted a scene from the Old Testament. Behind this scene, watch the peasants, they look out from around the corner and even climb onto the roof. The artist portrayed the Magi, moving away from the general accepted rules. Before that, the Magi were portrayed only by the Jews. Peasants do not look so peaceful and harmonious, they behave even impudently and with worthy magicians look miserable. The person standing in the doorway attracts attention. He is dressed only in a shirt and a cloak, his crown is on his head and he looks hopefully at the baby. His face exudes joy, while most of the characters express hostility. The cloth of this character’s clothes depicts demons, perhaps he himself is the devil, and most of the surrounding is his retinue. In his hand, this man holds one of the Magi’s helmets, which speaks of his superiority and leading position. Drawings on the clothes of a black king show his belonging to paganism. The sky turns into golden gleams, this technique is often used by the artist in his work. It would seem an understandable biblical scene, but small details speak of evil, which is scattered everywhere. Drawings on clothes, unusual poses of characters, animals and gifts all form a single picture with a deep philosophical meaning. Animals symbolize the obstacles that await any person on an uneasy life path, the struggle with them and makes up all existence. The painter portrayed many characters and an unlimited distance, showing the scale of the world and its diversity. All images of the picture are multifaceted, they can not be characterized by certain features. Description and meaning of the painting Adoration of the Magi by Hieronymus Bosch.